World Premiere: 17 mars 2007, au CNSMDP, Paris. On Saturday, March 17th, 2007, at CNSMDP, during the séminaire littérature musique, organized by F. Nicolas and M. Chaillou, with the collaboration of the CDMC and the CNSMDP, I exposed a system to musicalize the speech. The participants, the poets M. Chaillou, V. Novarina, J. Réda, O. Cadiot, P. Beaussant and M. Deguy explained the role of the music in their works and read a short extract of their writings. I recorded these extracts during day and mixed them with already collected recordings of other poets (Arthaud, Claudel, Eluard, Jouve and Malraux, extracted from the CD ” voice of poets “). I presented all of them at the end of the seminar in a musicalized way and in random order inviting poets and public to find out from which poet comes from the melodies. 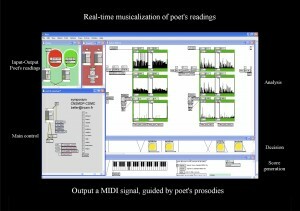 I used a MaxMSP-FTM developed software that creates in real time score/midi notes mirroring speech prosody.